This gentle floral water, balances the PH of the skin, while delivering intense hydration and antioxidants, to protect from the signs of aging. Improves the overall tone, texture and reduces the size of pores. Handcrafted Beauty has created a beautifully simple toner that is rich in natural antioxidants, and contains a complex blend of vitamins and minerals. Each batch begins with the finest organic roses, and uses the traditional distilling process to create an enriched nourishing water; which is then combined with organic witch hazel and aloe. This gentle floral water, balances the PH of the skin, while delivering intense hydration and antioxidants, to protect from the signs of aging. Improves the overall tone, texture and reduces the size of pores. The natural pink color imparts a healthy glow, leaving the skin looking absolutely radiant. Spritz on a cotton round and apply to clean face and neck avoiding eyes and mouth or spritz directly on your skin. Follow up with Daily Moisturizing Oil. 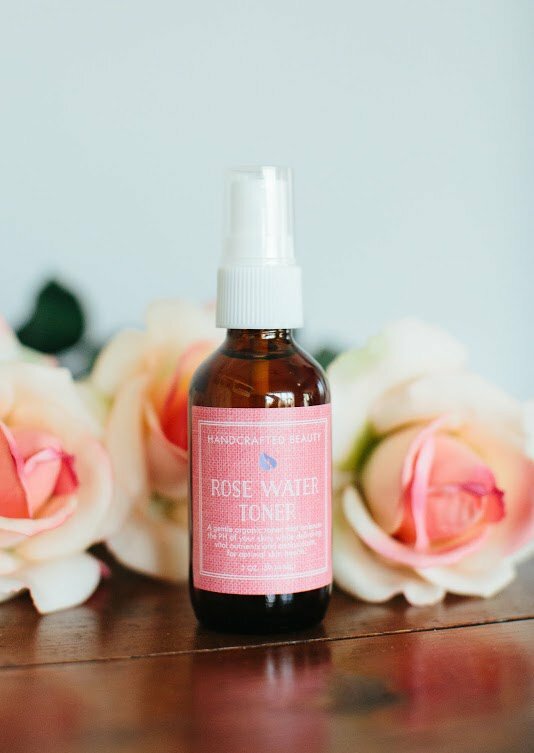 Rose Water is also great for setting your makeup and producing a gentle dewy glow. Simply mist face after makeup is applied. Aqua(Spring Water), Aloe Barbadensis Flower Extract(Aloe Vera), Hamamelis Virginia Extract(Organic Witch Hazel), Dried Organic Roses, Dried Organic Calendula, Citric Acid. Organic Roses: Natural antimicrobial and antibacterial, rose water has gentle cleansing properties. The gentle water also acts as an anti-inflammatory helping to reduce swelling or redness in your skin. Contain a complex blend of vitamins, minerals and antioxidants that support and sustain healthy skin function. Great to fight against the environmental signs of aging. Aloe Vera: Gently hydrates, soothes and refreshes skin. Contains as much as 75 nutrients, 20 minerals, 12 vitamins and 18 amino acids, aloe helps heal and repair damaged skin cells. Organic Witch Hazel: A natural astringent that gently removes dirt and impurities from the skin while shrinking pores and improving the overall tone and texture. Also known to naturally lighten the appearance of age spots. Organic Calendula: Widely known for its healing properties, Calendula has been proven effective in the treatment of eczema, psoriasis, dermatitis, and other skin problems, including skin wounds. Gentle enough for the most sensitive skin, Calendula also stimulates collagen, improving elasticity. I have never been a big fan of toners and always saw them as a waste of time/money. However, I decided to try again with this company and I am so glad I did!Makes my skin look awesome! Such a great group of products! I’ve never understand the purpose of a toner and thought it was a waste of a step but gosh was I wrong! This was definitely the missing piece to my full regimen of facial skincare!! I love the way it makes my skin feel after I cleanse with the Almond Honey Cleanser and I’ve been loving my clear and even toned 35 years old skin!! I’m finally able to comfortably leave the house with little to no makeup and I love it!! I’ve been making my own toner for awhile and it was working just fine but it smelled a bit too much like ACV for my liking. I decided to try this and I love it! Using this skincare system has totally changed my skin and made me feel so much more confident without makeup!